This Article explores the development of copyright law’s first sale doctrine and the Record Rental Amendment (RRA) in light of the Sixth Circuit’s interpretation of the RRA in Brilliance Audio, Inc. v. Haights Cross Communications, Inc. This Article does not take issue with the court’s conclusion, but instead uses the differing conclusions of the majority and dissent to illustrate that the RRA exception is in need of Congressional clarification. This Article also examines whether the Record Rental Amendment should be amended to include audiobooks and other non-musical works, concluding that they should. The author then proposes two alternative amendments to the RRA; one to expand its scope to cover non-musical phonorecords, and one to clarify that it does not. Originally published in the Lewis & Clark Law Review, 11 Lewis & Clark L. Rev. 605 (2007). 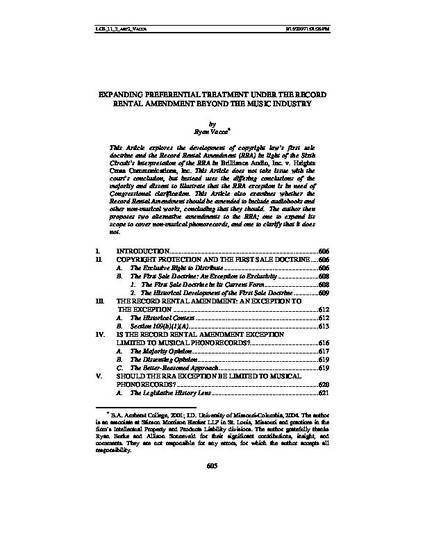 Ryan G. Vacca, Expanding Preferential Treatment Under the Record Rental Amendment Beyond the Music Industry, 11 Lewis & Clark L. Rev. 605 (2007).